2001 was a year of reunions. The day after I rode the Tour de Cure I received an email from Cathy Renner, my old high school crush. I hadn't spoken to her in 14 years or seen her in 17 years. She said she'd been looking for me (?). I couldn't imagine why...she wasn't interested in me in high school (she now claimed otherwise), didn't return any letters I wrote after graduation, and although I phoned her in May 1987 and we had a very nice talk for hours and she had my phone number, she never returned a call or tried to call me. Hmmm...I promised her I wouldn't tell anyone here she's crazy...I keep my promises. 'Tis not for me to ask why I suppose. It was nice to have her as an email buddy and talk about things we could never talk about as two immature 17/18 year-olds. We were now old folk. She was living in Alabama with her husband and 25 kids. I'm glad she contacted me. 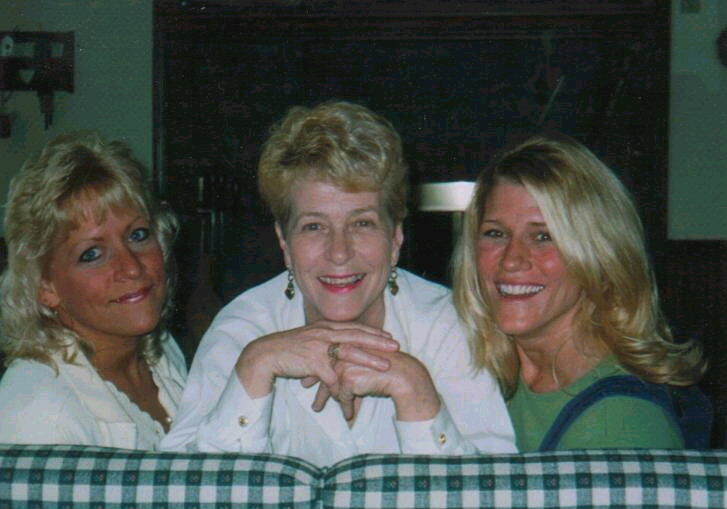 This is a recent photo of her with her mother and sister. She's the pretty one. 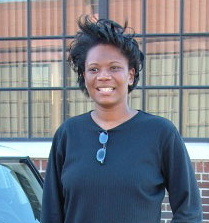 On July 3, while walking around the campus I work at on Langley Air Force Base, I noticed a tall black lady I'd never seen there before. Who could that be? I was later walking again and there she was walking in front of me. I figured she must have been a new person in the unit. We had about 440 people there in my unit, so I could've missed a newby. Then she stopped, turned around, and said,"I've seen you somewhere before". I looked at her name tag---Oh my! It was my dear lost friend, Lyn McClain! We were silent for a second and then I threw my arms around her and hugged her long and hard right there in the parking lot. I couldn't believe it! I hadn't heard a peep from her since the day I left Offutt Air Force Base on December 17, 1987. We were both giddy and excited, asking each other where our lives were and catching up on 14 years. It was so nice! After that Lynn and I emailed and went to lunch together. It was fantastic! Lynn was the woman I took on my very first date way back on September 19, 1986 and here she was sitting in a Taco Bell in 2001 staring at me with her big beautiful black eyes. So nice. Mike: It was really nice to talk to Lynn. I feel so comfortable talking to her. Mom: I have tomatoes (silent pause) Do you still eat tomatoes? Mom: You can have some fresh tomatoes from the garden when you come home. Do you still like to eat tomatoes? Mike: I don't buy them but I like them on my sandwiches. Mom: If you come home you can have tomatoes! Mom: I have a few rotten ones but there are still some really nice ones in the bunch. So you don't keep tomatoes? Mom: If you come home you can have some of my fresh tomatoes! Mom: When you lived at home you used to LOVE my tomatoes. You remember how you used to love my tomatoes so much? Mike: I didn't have to drive as far to get them back then. Mom: Darrel still hasn't found a place in Virginia Beach for Wendi and him. Did you say there are other places with beaches? Mike: This whole area is surrounded by water Mom, it's a peninsula. Everything has water around it. Mom: Where was the place you said was good? Mike: There are beaches and water everywhere. He needs to get a map and just start checking for lodging. Mom: You said there was a place that had a beach. Mike: Let's see...Portsmouth, Hampton, Yorktown, Chesapeake, Suffolk, Norfolk, Newport News, Williamsburg, Virginia Beach--they are all near water. Does he want an ocean beach, a river beach, or just to be near the water? Mom: You said Hampton before, but is that next to the water? Mike: Yes, I told you it's on the water. They have a place there called Buckroe Beach. Mike: Buckroe Beach is a beach in Hampton--yes, Hampton is on the water. Mom: What about Williamsburg? Is that near the water? Mike: It's next to the York River, but he has to decide if he wants to be on the ocean or not. Mom: But Williamsburg is too far for him. Mom: But it's over 100 miles? Mike: No! I told you it's very close! I can reach it by bicycle in under an hour! You need to get a map so you can see where these places are situated. Do you have a map Mom? Can you get your road atlas? Mom: Lynchburg just kind of stands out a lot on this page. Mom: My friend's boyfriend used to be stationed in Roanoke. Isn't there an army base in Roanoke? Mom: Didn't you say there was a military base in Roanoke? Mike: There's one near Blacksburg which is near Roanoke, I think. Not sure. Mom: But that's army? Oh well, that was during World War II. Mike: Things have changed a little. I'm on the east coast.